This recipe is from the Superbly Swedish Cookbook, edited by Martha Wiberg Thompson, although, I have made some changes. This is the recipe that I used to made the cookies for the New Member Reception. *Vanilla Sugar (Vaniljsocker) A powdered sugar with a strong vanilla flavor is available in import stores. One teaspoon of vanilla sugar equals one teaspoon of liquid vanilla. Cream together butter and sugar. Add vanilla and flour, mixing well. Divide dough into four pieces and roll each the length of a cookie sheet, about 1″ in width. Flatten slightly. Bake at 325° for 12-15 minutes. 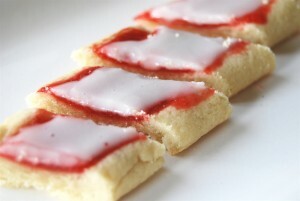 Immediately brush with Lingonberry jam and spread with glaze made by mixing powdered sugar and vanilla sugar or vanilla with water until of spreading consistency. Cut diagonally while still warm. : Use raspberry jam or strained cranberry sauce instead of Lingonberry jam.